Showing your never ending support for Arthritis Awareness is one step closer to finding a cure. Every time you wear our Cure Arthritis Awareness T-Shirt, you will be helping other advocates in spreading it’s awareness. Perfect for walk events or any day you see fit. 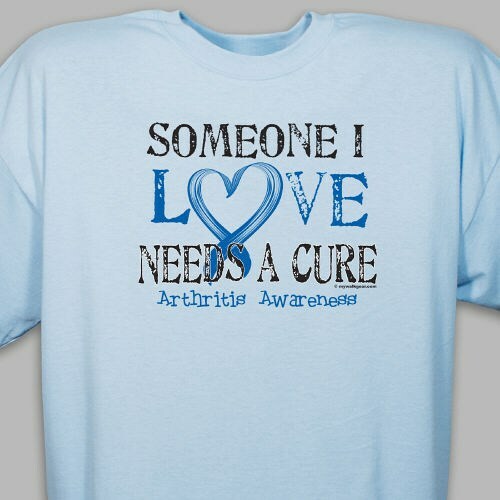 Our Cure Arthritis Awareness T-Shirt is available on our premium 100% cotton T-Shirts, machine washable in youth sizes XS-L and adult sizes S-3XL. Additional Info MyWalkGear.com encourages everyone to gather together and show their support for Arthritis Awareness with Arthritis Awareness Apparel & Walk Gear. Help us help those who need us the most with this inspiring Awareness T-Shirt & our Cure Arthritis Awareness Tote Bag & Arthritis Awareness Water Bottle.